This past week has brought days of crisp weather and a touch of drizzle. As much as I have resisted (denied!) the retreat of summer, I’m starting to welcome fall. I’ve pulled my favorite comfy cardigan out of the closet, and I’ve found myself brewing a few cups of tea. Yes, fall seems to be creeping in whether I like it or not! I found this beautiful tablescape at Stone Gable Blog. If we’re headed into fall, we might as well celebrate in beauty, right? Blue and white porcelain happens to look amazing with fall colors (what does it not look fabulous with?!). 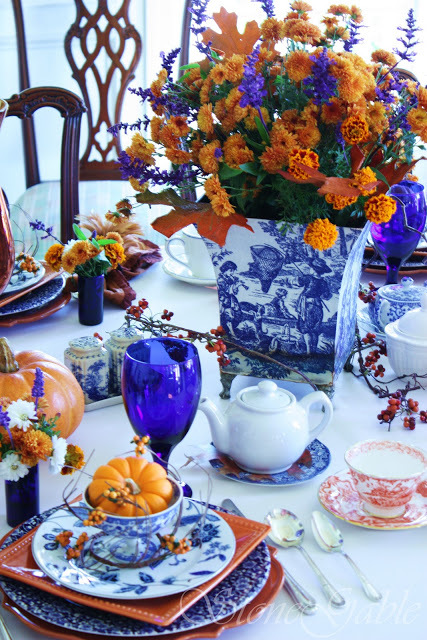 If you’re inclined to set a pretty fall tea table, you can get the look at Pursuing Vintage! Each of these beautiful blue & white pieces is available in the Pursuing Vintage Shop! Go ahead and get that fall tablescape ready! Would You Like Foo with Your Coffee? Kristen I love your blue and white pieces and adore a cup of tea on a cool evening!